The obvious controversy faced by Paranormal Investigation for many years has decreased a lot due to a greatly understanding through the scientific approach. The use of current technology in research has brought new light, and has improved credibility in Paranormal Activity. This course is focused in the Scientific Approach to Paranormal Investigation, and directs you to find the TRUTH concerning a haunted location. In other words, you will learn how to perform a Paranormal Investigation, and rule in or rule out Paranormal Activity without preconceived ideas, but through real evidence. 5) How to solve the case. This course is not limited to provide information. It also contains exercises for creating skills, including a test-yourself for each unit. In Part II, Conducting an Investigation Step by Step is explained and illustrated based on a real case, with real pictures ant other evidence. 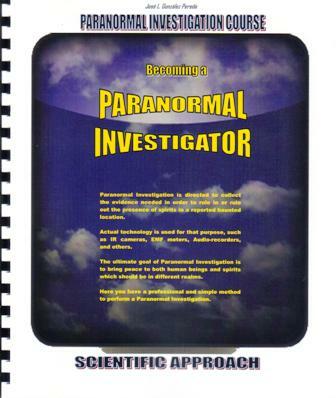 This is a professional course for people interested in becoming a Paranormal Investigator. Regular price is $60. Download it right nor for only $9.50 by PayPal. When you place your order please, let me know if you are interested in Part II.